Apart from being a fashionable, late winter colour, red makes you feel toasty warm and cheerful, just what you need to combat this winter’s icy coldness. 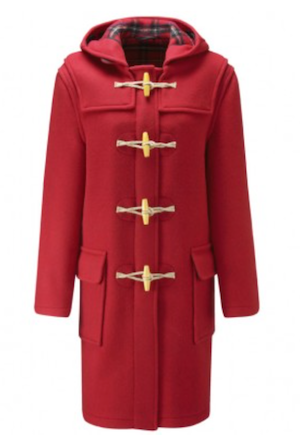 This lovely coat will take you effortlessly from season to season and has some distinctive wooden toggles that give it a delightful vintage appeal. Made in England from Italian cloth from Tuscany this coat helps your ‘green’ credentials too; its wool component is recycled. Combined with other fibres the smooth finish and cosy softness is assured. You won’t break your post Christmas budget either because it has £200 off the list price. 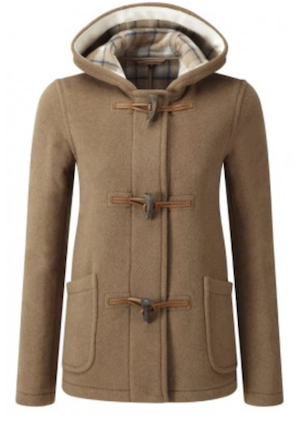 If you prefer a shorter coat, suitable for commuting or the school run, my next choice the short ladies duffle coat in classic camel is for you. Cut to flatter, this coat’s hood flattens, when not in use and has stylish, useful large pockets. Camel is included in this spring’s neutral palette of colours. Another budget saver, reduced by £175. Finally one for the men. 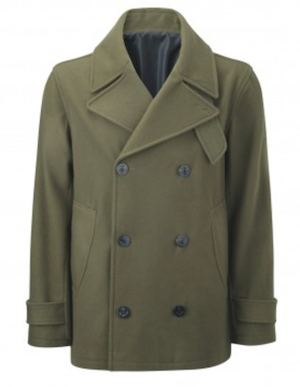 A versatile lined Pea Coat in olive. This coat is suitable for the really cold days as it has a removable throat flap to keep the warm air in when the wind blows. I love the colour of this coat, which makes me think of spring time and the rich variety of greens we’ll soon be seeing. A breeze at £75. Check out the sale out for yourself and get an early Valentine’s treat!